SSC JE 2018: Staff Selection Commission (SSC) has released the admit card for paper 1 of SSC JE on January 9, 2018. The admit card has been issued online and candidates can download it by entering their roll number and date of birth. The paper 1 of SSC JE 2018 is scheduled to be conducted from January 22-29 (January 26 and January 28 being holidays), 2018.The SSC JE admit card for some of the regions like Southern Region, Madhya Pradesh Region, Central Region and North Western Region are available for download. 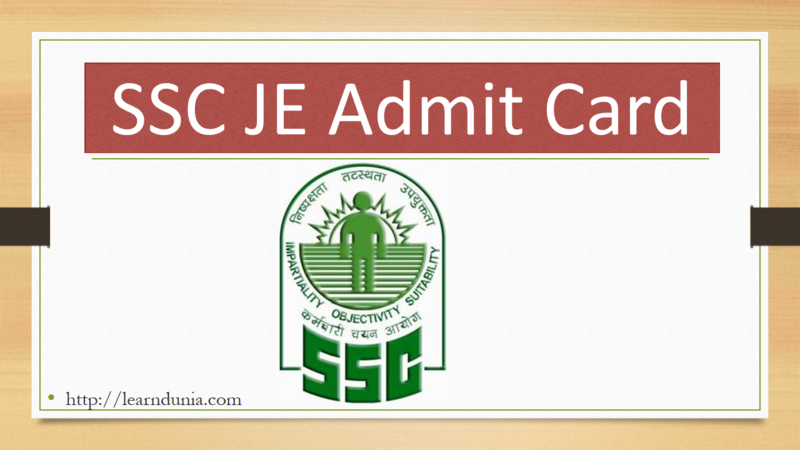 SSC has released the admit card the admit card for the JE Exam 2017-18 & Computer Based Online exam will be held from 22nd January 2017 to 25th January 2017, All the candidates who have applied for the post can download the admit card through the Link Given Below. Candidates should carry the hard copy of the admit card without fail to the examination centre. Candidates should affix a latest passport size photograph similar to the one provided in the application form in the given space on SSC JE 2018 admit card. Candidates will have to produce their SSC JE admit card and the photo id proof to the invigilator. Candidates reporting to the venue without admit card will not be allowed to sit for the exam. Candidates should check and follow the reporting time as mentioned on the admit card. Candidates reporting to the exam centre after the time mentioned will not be allowed to sit for the exam. Candidates reporting to any other exam centre than the one allotted will not be allowed to appear for the examination. Click Here to View SSC JE 2017-18 Notification, and more.